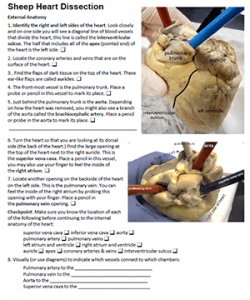 Students use this dissection guide to learn the anatomy of the heart, using a sheep as a model. The sheep heart is similar to a human, and students can identify the major vessels: aorta, pulmonary artery, pulmonary vein, and the vena cava. The guide includes instructions on how to determine which side of the heart is the ventral (front) side by searching for the auricles and the interventricular sulcus. Students are instructed to cut the heart lengthwise through the atrium and ventricle so that each side can be opened and compared. (I describe the cut like opening a hot dog bun on each side.) Students usually notice right away that the left side of the heart is much thicker and more muscular than the right side of the heart. The guide suggests using colored pencils to help show where a vessel, such as the aorta, connects to the left ventricle. Colored pencils can also be used to mark the locations of vessels once you have located them. Students tend to find the heart confusing because it’s not obvious which side is left and right. Specimens can be ordered from biological supply companies or Amazon. Fresh specimens can be obtained from local butchers. Ideally, models should be placed at lab stations for comparing the specimen to a human heart. I keep a photo album of images that I share with students before and after the lab, and include in a mini-practical. Students who miss the dissection can view the video of the dissection. Students can also view the Virtual Heart Dissection. *time can vary, some students will go slowly and carefully through the steps.